The Branch of REWARD Foreign Language Centre in the Voroshilovskiy District is conveniently located in the heart of this district, between the hotel ‘Yuzhnaya’ and Sovetskaya Square. 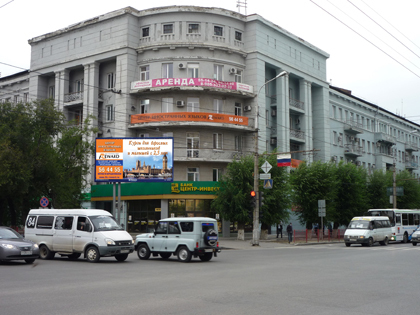 Our address is 22 Raboche-Krestyanskaya St. (office Centre ‘Stoliya’). The branch is situated on the second floor in comfortable renovated classrooms equipped with audio-visual equipment and other equipment necessary for high-quality teaching. The library of this branch has all the necessary teaching and methodological resources, descriptive materials and hand-outs. We offer classes in numerous foreign languages including: English, German, French, Spanish, Italian, Chinese, Portuguese, Czech and others. Classes are conducted by qualified and highly skilled teachers from Britain, Canada, The USA, Italy, Spain, Cuba, and China. They have an excellent knowledge of foreign languages, are experienced in modern methods of teaching and they are enthusiastic about their work. (See: Our Teachers). We invite adults, school-kids and children from 2.5 years of age to our courses. We offer individual or group education in small groups (5-8 people), and premium groups (2-3 people). The Children's Development Center works for children from 3 years of age. Besides English language classes it involves four general developmental subjects. Three of them (Math, Arts and Rhythm) are taught in the English language. A unique program of children’s development in two languages, ‘General Development + English together with Mom’, is opened for our the youngest students from 2.5 years of age. This program provides an opportunity for children to discover the world and themselves in the most comfortable environment, gradually, though various and exciting ways, master English and immerse themselves in the new world of English-speaking culture. 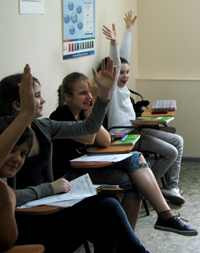 Beside courses, the branch in the Voroshilovskiy District provides different additional educational programs for better foreign language acquisition. There are Sundays English clubs for adults and school-kids, linguistic weekends with native speakers – ‘Immersion into the Language’ for adults and school-kids, linguistic camps for school-kids, festivities, study abroad etc. Our free of charge level test will help to determine your level of language skills and choose the best educational program for you and your children, and our teachers will provide you not only with high quality training, but will also make the lessons really interesting, fascinating and informative. The tests for new students take place in the office in classroom №204. Our friendly and efficient managers are always ready to answer any questions you may have. Call: 56-44-55, 98-05-99.